Negotiation techniques are used when there is a discussion between two or more people with separate objectives for a common situation. In any market, and for any product or service, negotiating the deal is a crucial sales training skill. Learn how to negotiate and you will close more sales, make more profit, and earn more money. With the right training you will no longer fear negotiating but look forward to it because it is another step nearer to closing the sale, and you can do it well. I use sales negotiation skills in two places and it works really effectively for my sales teams. The external real world and the buyer's internal world, where their thoughts and beliefs influence their decision making process. It sounds deep, but stick with it the negotiation techniques are worth trying out. And they're easy to pick up and use once you understand how your buyers make a decision. The external real world is where you make concessions and ask for something back in order to close a sale. The buyer’s internal world is where you change their viewpoints and perceptions to move closer to a sale and overcome obstacles to the deal. Use them both together and you have a powerful sales negotiation tool. Like the other parts of the Sales Process you weave your negotiation techniques into the sales stages. 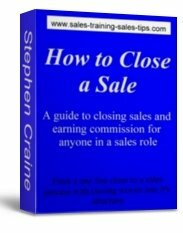 Don’t wait until the close of the sale to start negotiating. Get your information as early as possible. Ask the questions in the questioning stage of the sale. 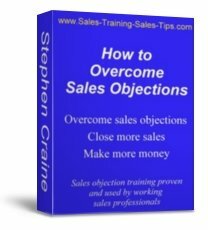 Pre-empt common objections in your sales presentation. Think of this as a holistic approach to selling techniques. In sales training you learn skills by breaking the sales process into sales stages. But in practice the sales stages are inter connected and are one complete sales process. Negotiating and closing are woven throughout the sales process. Familiarise yourself with the sales process below and then you can work on weaving your sales negotiating into the sale. From making an appointment, through the sales process, to closing the sale, and how to get sales referrals. What’s in the buyer’s mind at the start of the sales negotiation. How does the customer form their map of their starting position in a negotiation. The customer is starting the negotiation with a set of ideas and viewpoints, where did those ideas come from? The buyer's beliefs support their negotiation starting position. On price for example: They may be saying the price is expensive because they can’t see the value they will get from the benefits you have presented. The buyer could be comparing your price against a price they presumed they would be paying. Part of effective negotiation techniques is to find out what that presumption is based upon. You have to know where they are starting from before you negotiate. They are starting from a position that has been formed from information they have taken in. That information may be incorrect or they may have distorted it. During the early part of the sales process include questions that show you their starting point and how it was formed. You will know how to negotiate more effectively if you question their budget, price expectations, and what they think will be included. Ask what they paid for what they have now, what other deals have they seen, and what they know about the market now. A great negotiation technique is to decide what viewpoint you would like your customers to have and install it during the sale. Use it in your marketing and project from and around your business premises. If you are selling cars and you have a definite policy on trade-in value, tell the customer how that policy works. Shout about it on your adverts and in your showrooms. Be up front and honest with them. This will stop them making up their own version and will give them confidence in your sales process. During the sales process have you discovered what is important to the buyer? It could be price, finance deal, trade in value, after sales service, or many other features and benefits. Throughout the negotiation techniques remember that is what you’re selling to them. Don’t go back into rambling on about features, they want the benefits. That’s how they build the value in their own mind. You and the customer could appear to be miles apart. Too many sales people in all industries focus on the problem. They put their attention on the differences between what they can offer and what the customer wants. The best way to learn how to negotiate is to start with negotiating techniques that look at the buyer’s starting position. Agree with the buyer what you have in common regarding the sale. In any negotiation start with what you agree on. Use negotiation techniques that finds common ground. A starting point on which to build the negotiations to a win-win situation. ...And make sure you talk in benefits that you offer, not features..
For more on using benefits and features to win more sales click on Sales presentation tips and learn great sales skills that will add to your negotiation techniques. Remember there are two negotiations going on at the same time. One is in the real world. The other is in the internal world of the buyer’s mind. Your objective is for you and the customer to see the sale from the same viewpoint. To move towards a similar viewpoint. You can do this in the external world. For example the customer and you have a distance between you when negotiating price. Your price is higher than they want to pay. If you drop your price you have moved to where they are in the external world. This is using external negotiating techniques. In the same situation you might stick to your sales price but build the value of your product by changing the internal viewpoint the customer has on the price of the product. The customer has moved closer to your position because of this changed viewpoint. Nothing has happened in the external world. It’s the same product at the same price. This is sales negotiation techniques for the internal world. Give and take. In the real external world you can use give and take negotiating skills. If you make concessions to the buyer you want something back in return. Always gain agreement to the buyer making a move before giving away any ground yourself. Price is a relative term. Before you make any price concessions make sure you know what will motivate the buyer to agree to the sale. Do they want a cheaper price, or do they want more value for their money. Is it the total price that they think is expensive or the finance deal. To understand their motivators you use negotiation techniques that focus on their internal world, and then take action in the real external world. If you start dropping prices, or adding value, before you know what will motivate the buyer you could be giving them money and getting no movement towards a sales in return. Motivators play a big part in learning how to negotiate. In negotiation training it’s important to know when to stop giving. You must know your imitations, when a sale is no longer profitable, and notice when giving is not getting a response that moves the buyer towards a sale. If you get to that position it may well be worth asking the buyer a direct question. Such as, what will it take for them to agree to buy today. There is no point making a sale if it doesn’t make you any money. Good negotiation techniques not only close more sales they gain more profitable sales. You have physically given them the product. For example the new car on the test drive. You have left them holding the keys to their new car. If they don’t agree with you in this negotiation you are going to take back the car. Its theirs, all they have to do is agree a price. This one last hurdle and they keep the car. When you give them the car you give them the benefits. In your presentation and test drive you made the benefits real. Now all they have to do is agree the deal to keep those benefits. Use this in your negotiation techniques and in your communication with the buyer. Refer to the car as theirs. The car they have now, their new car. If they are looking for free add-ons and extras get them to see what’s important. Are they really going to give back all those benefits you’ve had them feeling just because you’re not throwing in a free extra. Can they picture the consequences of saying no now, and the benefits they will get from a simple yes? Create the pictures and self talk you want the buyer to have. This is important because no matter how good the deal, if they think you’re holding back on what you could give them, or starting high to allow for negotiating a discount, it will be hard to make a sale. Trust comes from feelings that are created as a result of the pictures the buyer makes, and the self talk that goes on internally. Work on their internal image of you. Build their perception of your integrity and professionalism. If you make a concession, or give something away, make sure you get something back in return. Before you agree to the request gain agreement to something you want. If you can arrange for a smaller deposit will they sign the deal today. Don’t just keep giving in the hope they will say, okay we’re ready to sign. Closing the deal in sales is all part of the negotiation techniques. At each stage of the sales negotiation process gain some agreement. The buyer makes a demand and you cannot, or will not go that far in the sales negotiation. When you say no make sure you look and sound like you mean no. No hesitation in your voice. No give away body language, such as rubbing the side of your face. Nothing to make the buyer think there might be a chance of gaining their demands. Tell them you can’t agree to their request. Use a firm voice and direct words. Avoid words such as, I think, or I doubt. Use I can’t, or that’s not possible. You can give a reason as to why you can’t agree to the request, but don’t make excuses. Excuses give the impression you should be able to do it, but can’t. Good solid reasons support you’re answer. Negotiation techniques are part of the sales process. Build them in to your sales meeting as early as you can, especially into the questioning stage of the meeting. Understand the buyer’s starting point and how they got there. Get into the internal world of the buyer. Remember this important sales negotiation training tip. A concession made in the buyer’s internal world rarely has any cost to the seller associated to it. Change their viewpoint to move it closer towards yours and closer to an agreement. If you give concessions in the real external world make sure you get something back in return. When you say no make sure you sound and look like you mean it. Remain focused on the objective, the sale, and know where you’re negotiation boundaries are. Keep building your sales negotiation techniques and skills.